Since last year, when we celebrated the International Women’s Day in Berlin and underlined the importance of women’s unity against Islamic fundamentalism and extremism as the most serious global threat, there have been tremendous changes and developments the world over. The global terrorist threat continued to evolve rapidly in 2015. ISIS provinces spread from Nigeria and Algeria in Africa to Afghanistan and Pakistan in southwest Asia. Vicious terrorist attacks went far beyond the Middle East and Africa and victimized innocent people in France, Belgium and the United States. The intensification of the war in Syria, and the continued barrel bombing of innocent women and children in the cities sent a flood of refugees to Europe despite thousands of deaths in the sea, impacting the lives of people in Europe and elsewhere. ISIS abducted, systematically raped, and abused thousands of women and children. They were sold with price tags in slave markets, forced into marriage and domestic servitude, or subjected to physical and sexual abuse. Boko Haram did the same in Nigeria. And of course, the Iranian regime remained the foremost state sponsor of terrorism, providing all forms of support, including financial, training, and equipment, to terrorist groups around the world. It continued to remain deeply involved in the conflict in Syria, working closely with the Assad regime to counter the Syrian opposition. Tehran also continued to provide support to militia groups in Iraq, and supported violent terrorist attacks in Bahrain. All the above facts just underline women’s responsibility as equal human beings to tackle this most dangerous threat to our world today. 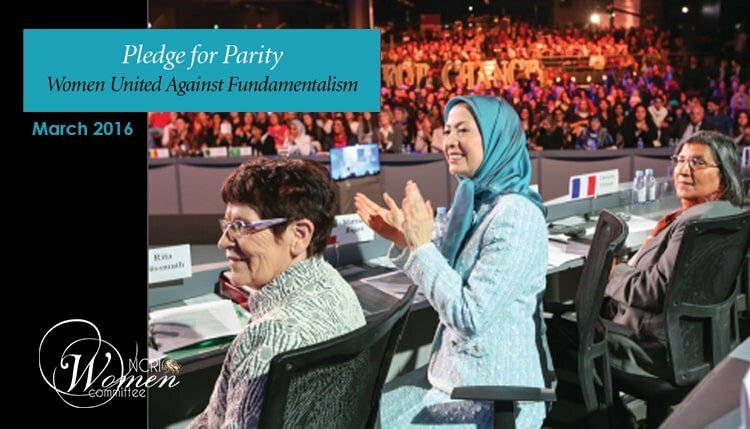 The experience of the Iranian Resistance is that women can gain their rights and achieve equal participation in leadership and management roles only if they get involved and prove their worth in the most urgent and fate-making problem facing their country which is freedom from its tyrannical fundamentalist rulers. Women’s role has been indispensable to the Iranian Resistance through its most demanding years. Without women in leadership positions, the Iranian Resistance would not have survived the mammoth hardships of the past 20 years. As we are striving to reach 50-50 parity by 2030, we need to focus on the most urgent problem jeopardizing our planet and the achievements of the human civilization. As women, we need to mobilize all our strength, potentials, talents and resources to counter policies aiming to appease Iran’s clerical regime for economic interests. We need to prevent engagement of the Iranian regime in the peace talks on Syria as it is the party keeping the criminal Assad regime in power and adding to the pain and suffering of the people of Syria. We need to help the women and children of Syria who are being starved under inhuman blockade and we need to help find solutions for resettlement of the Syrian refugees. We need to raise awareness in our societies about the source and root cause of this savage war and violent terrorism under the banner of Islam, namely the Iranian regime, and do not allow other issues to overshadow this truth. And it is in resolving this greatest, fate-making problem of our time, the global threat of Islamic fundamentalism and extremism, that women can prove their power and worth, change the attitudes, and achieve a genuine 50-50 parity by 2030.